Spend the afternoon with Sandor Katz in our space at The Arts Center of Cannon County. You’ll learn the basic principles behind familiar fermented favorites such as beer, sourdough and yogurt and see demonstrations of intriguing live foods like kombucha and kefir. 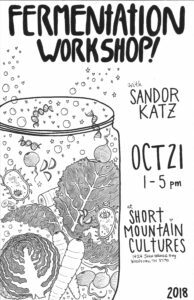 Snack on a beautiful spread including delicacies from Short Mountain Cultures and get juicy in a hands-on lesson in sauerkraut-making. Leave with a jar of your very own kraut to ferment at home. Preorder Ohio Stoneware crocks/weights/lids, tempeh starter culture, kombucha scoby, or jun scoby to ensure availability. Cultures come with instructions for fermenting at home. Local pickup the day of the workshop or pick up at The Franklin Farmers Market or Richland Park Farmers Market of Saturday, October 20 if you are not coming to the workshop. E-mail shortmountaincultures@gmail.com if preferred method of payment is by check.